MORE THAN 9,000 firearms and ammunitions seized from smugglers in Kumasi in 2015 have been handed over to the Ashanti Regional Police Command for use. The weapons include 11 AK 47 assault rifles, eight Mas MLE weapons, one AK 47 light magazine, 15 AK 47 magazines, one GPMG with bipod-s/no. A=35007, and 6,898 mm (7.62) X 39mm ammunitions, as well as six pieces of 12.7 MM anti-aircraft ammunitions. The rest are 50 rounds of 9MM pistol ammunitions, 151 MMX (5.5) 45MM Nato, 1,661 rounds of 7.52mm x 45mm ammunitions, nine Mas MLE 1936 magazines and their butts, six Mas 1949 magazines, nine SMG magazines, and 2.9mm pistol magazines. A Kumasi High Court made the surrender yesterday following the successful arrest of three men – Umar Moro Satta, 74; Frank Badu, 25; and Suleman Alhassan, 26 – who smuggled the illegal weapons into the country from West African countries, particularly from Cote d’Ivoire to Burkina Faso. The three persons were slapped with 14-and-half years’ imprisonment by the court presided over by Justice Obiri Yeboah. Umar Moro Satta, a 74-year-old Burkinabe arm dealer, was jailed 10 years, while Frank Badu and Suleman Alhassan were jailed four years and six months respectively. The three were found guilty by a seven-member jury for possessing arms and ammunitions without lawful authority. They were arrested on December 11, 2015, at Akwatialine, Alabar and Bosore alongside Ibrahim Hamidu, 40; Mohammed Zibilla, 27; and Mwinbom Alphonse, by personnel of the Ashanti Regional Police Command from the Manhyia Division. The officers uncovered and seized a large cache of firearms, including 11 AK47 assault rifles, 10 G3 assault rifles (anti-aircraft ammunition of NATO standards), large quantities of other ammunitions, rounds of bullets and other locally made guns during the single swoop. 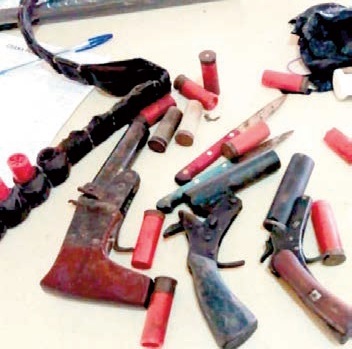 Officers of the Manhyia Divisional Police Command retrieved the arms after an “intelligence led” operation in the house of convict Moro Satta. Speaking at the handover ceremony, the Registrar of the Kumasi High Court, Ustarz Hamza, said handing over the weapons formed part of the orders of the court as contained in the judgment of the case. He stated that the court directed for the weapons to be handed over to the Interior Ministry for use by service personnel. DCOP Kwasi Duku Mensah, who received the weaponry on behalf of the Minister for the Interior, indicated that the weapons would boost the work of the police and other sister security services under the ministry.